SAN JUAN, PUERTO RICO (July 8, 2014) – IRONMAN and BN Sports, LLC today announced that registration for the fifth edition of the IRONMAN® 70.3® Puerto Rico triathlon will open at noon ET (TODAY), and will be available through the event’s official website at www.ironmanpuertorico.com. A special early entry rate of $199 USD will be offered until Saturday, July 12th at 11:59 p.m. ET. Scheduled for March 15, 2015, the IRONMAN 70.3 Puerto Rico triathlon is an epic race and athlete favorite. Professional athletes will race alongside age group competitors on a breathtaking course that showcases the beautiful island of Puerto Rico. The 1.2-mile swim course will take place in the Condado Lagoon next to the Caribe Hilton and Condado Plaza Hilton and the bike course leads athletes towards five different municipalities en route to the inner-loop next to the City of Dorado. The two-loop run course utilizes the City of Old San Juan enchantment and Spanish Forts of “El Castillo San Felipe del Morro and San Cristobal.” The race finishes at the beautiful “Parque del Tercer Milenio” next to breathtaking ocean reef views and amazing crowds! 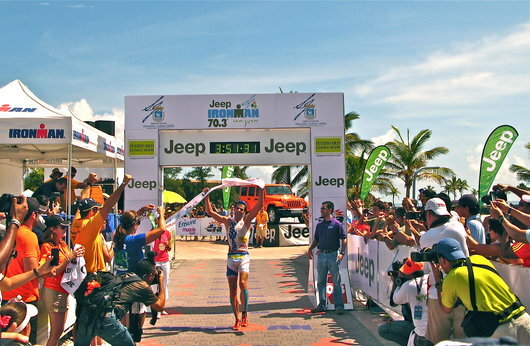 One of more than 70 events in the global IRONMAN 70.3 Series, IRONMAN Puerto Rico offers a professional prize purse of $25,000 and 30 age group qualifying slots to the 2015 IRONMAN® 70.3® World Championship, taking place September 6, 2015 in Zell am See-Kaprun, SalzburgerLand, Austria. For more information or to register for the IRONMAN 70.3 Puerto Rico, please visitwww.ironmanpuertorico.com. For media related inquiries, please contact info@bnsportsllc.com. BN Sports, LLC, is a citywide sports events management company founded in Puerto Rico in 2008. The company focuses on high-profile sporting events, which promote health and fitness awareness among participants, their family members and the local community. BN Sports’ events also aim to promote the destination of the markets it serves through various media channels, resulting in strong brand awareness for BN Sports sponsors and for the host city, while also positively impacting the local economy. Contact BN Sports at info@bnsportsllc.com.